All you need is Windows system and access to image file of the Virtual Machine (VMDK). User-friendly interface and powerful search engine allows for easy, fun and quick recoveries. My system on virtual machine has crashed, unfortunately, i've lost access to my useful files. I've used VM Data Recovery in Windows (Open->Virtual Machine->VMDK file). All data was accessable via this program. This tool also provides recovery of deleted files, data. Excellent job! Very good and simple software! I have recovered important data stored on virtual server. VM Data Recovery is compatible with following operating systems: Windows 7, 8, Vista, XP, 2003, 2000. VM Data Recovery is low level data recovery software using many and complex recovery algorithms. Built-in recovery mechanisms make the whole process appears to be simpler and it is possible to recover the data, which other programs can not handle. VM Data Recovery may detect and recover partitions in following systems: NTFS (supported recovery and detection of partition start with backup boot sector data), FAT32/FAT16/FAT12 (Recovery/fixing using FAT32 backup boot sector), Ext2/Ext3, ReiserFS, HPFS. 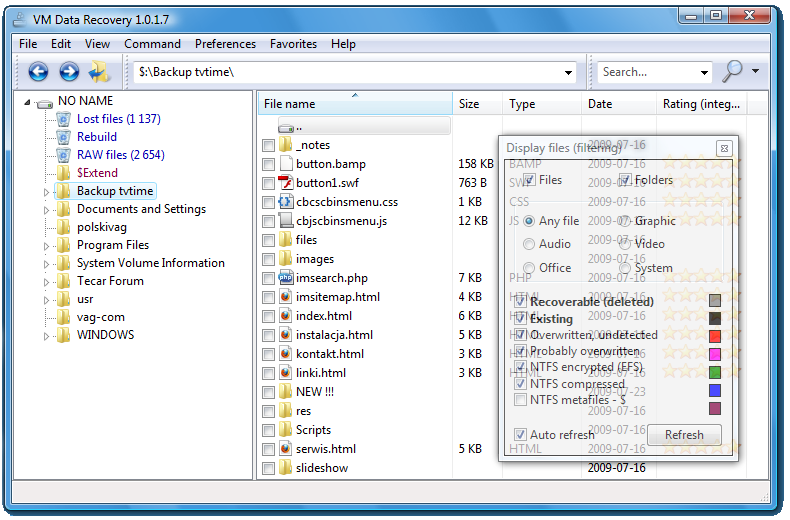 Additonal support for NTFS: NTFS encrypted files (EFS), NTFS compressed files NTFS metafiles. VM Data Recovery is high optimized, fast and intelligent application. You may explore files while scanning.